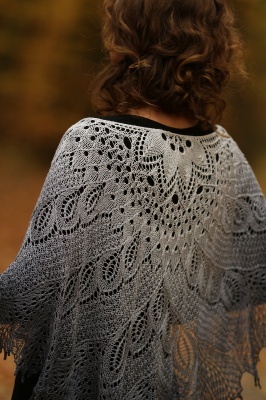 This is knit in Big Sur Twilight by Christine (aka "seagreen101" on Ravelry). 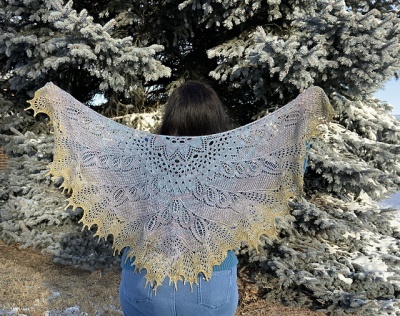 Designed as a collaboration by two of our very favorite designers, Nim Teasdale and Anne-Lise Maigaard, Wild Swan was originally a Mystery KAL that will started with the New Year. Well, no longer a mystery, this is truly a lovely piece. 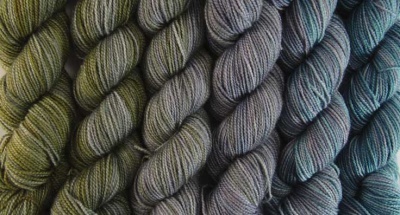 We offer two colorways in your choice of two yarns as a pre-order. Your selection will be specially dyed to your order -- it usually takes 4 to 6 weeks -- and then matched with the beads you choose and sent on to you. Truly a lovely lovely piece. 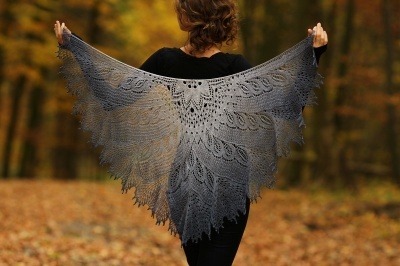 And note that the pattern is being offered for free! Get it and any additional data, when available, from this Ravlery page here. Note that the pattern is charted, not written out. Yardage: 600 - 700m (note that is about 656 to 766 yards). 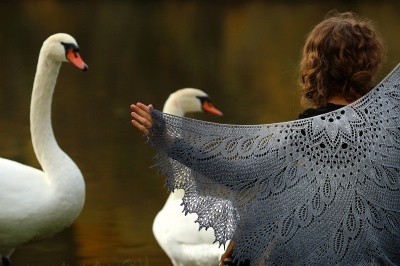 The shawl is worked from the neck down and bound off using either a knitted picot bind off or a crochet picot bind off, according to taste. 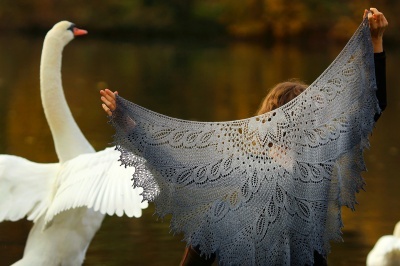 The finished size is approximately 23 inches (58 cm) deep and 52 inches (132 cm) wing span. 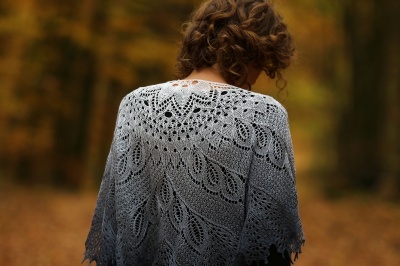 As written, the pattern can be ended between row 132 and 142, so final size will depend on where you decide to end, your yarn weight and needle size. Kelly (one of the awesome dyers of The Unique Sheep) and I contacted both designers to ask for suggestions on colorways they thought would look awesome with their design. We have two yarn types you can choose between. And two gorgeous colorways. 1. Verve2 is 100% superwash merino. It takes dye colors very well and is great to show stitch definition. 2. Leeana is a bit more expensive as it is made up of a 51/49 blend of cultivated silk/ merino (just a bit more silk than merino). 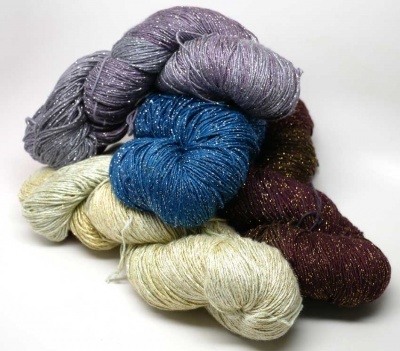 The best of both fibers, this has some of the memory/bounce from the merino with the beautiful shine that comes from silk. It tends to dye a bit more muted. 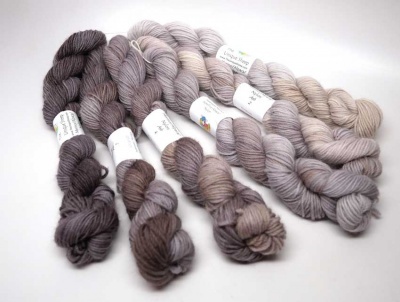 Your kit will have about 800 yards of your choice, in six skeins sets of about 33g each skein. 1. Big Sur Twilight is based on a photograph my son took on the West Coast. It has gorgeous olives and greys blending into blues. You can see a finished version in Big Sur Twilight in the last photo on this page. 2. Ash is a true neutral set. This is a play on gray with a whisper of browns to them. Deepening from a gentle and pale hue into deeper and deeper tones, it ends just shy of charcoal. The kits will include beads. How many is up to you. Note that the beads aren't charted in the usual way with their own symbol--- on this pattern, Nim and Anne-Lise simply suggest to bead certain stitches. On 12/6, Nim wrote to me, "We’ve made a small alteration to the pattern which means using more beads. 1278 (or 2140 for the extreme option)". So our standard "default" kit as it stands will give you 6/0 beads, roughly 107grams. Anyone who would like the "extreme" option will get closer to 180g. Nim also wrote, "We have ideas for how to use slightly less beads though, and will be happy to help people with managing this." So if you aren't quite happy with so many beads, there are choices. 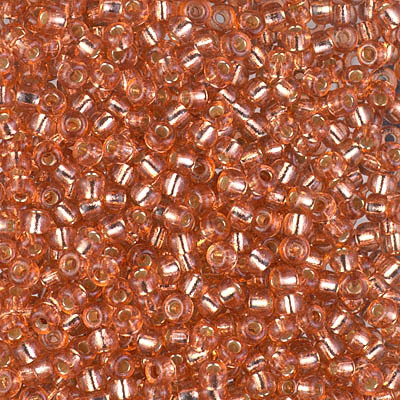 Take a look in the drop-down menu labeled "Kit" to set your bead amounts. Tell me if you have a color preference. Otherwise I will choose for you. And as the beads are optional, if you absolutely are decided against adding beads at all, tell me and I'll refund that portion of your order.